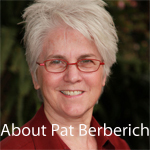 Pat Berberich is the owner and manager of Santa Monica Healing Arts Center. She has been practicing the Rolf Method of Structural Integration or Rolfing in the Venice- Santa Monica area for several years. She now has an office in Ventura where she works two days a week. Her clients have included dancers, athletes, actors, musicians, doctors, teachers, entrepreneurs, parents, children. Many have come for help with chronic pain due to injury or structural imbalances, and many for help with transitional periods in their lives, an evolutionary process that this work supports. She also practices medical massage and light touch energy work. Pat studied with Emmett Hutchins and Peter Melchior, the first two teachers that Ida Rolf entrusted with instruction in the method. She received her training at both the Rolf Institute and the Guild for Structural Integration. She has studied Quantum Touch with Richard Gordon and Matrix Energetics with Dr. Richard Bartlett, D.C., N.D.